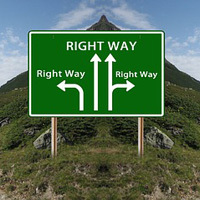 Setting up correct redirects is often the core business of any SEO consultant. It is the solution for many failed site set-ups and smaller issues. As explained in the next article, you should avoid 404 errors (page not found) as much as possible. Of course, we can not prevent all of those. If a user mistypes a URL that can hardly be foreseen (unless you are aware of known typo's people make), but in a lot of other cases they can be avoided easily. Especially if you are migrating from an old site to a new one, your URL's will change. When users do not update their bookmarks they end up on the old, non-existing URLs. Also, the Google index will take a while to update, and it will keep on sending users from the search results to your old URL's. This can heavily impact your search rankings! The same counts for smaller changes. If you change an alias for an article or a menu-item, the URL will also change. If you are lazy, you could choose to let all links automatically end up on the homepage. Then you have at least informed Google that they have been redirected, but you may lose all rankings built up for the specific pages. Better is to reroute the links on a page by page basis. This is a lot more work, but will give much better results. Then you also have to consider when to apply redirects. In the case of planned situations (like a redesign), both the old and the new URL structure are known. Then the best way to go would be to determine and fix these URLs before actually upgrading or changing your site, but as long as you quickly fix them after the URLs changed, you should be fine: in this case you simply monitor your 404-pages and fix them one by one. 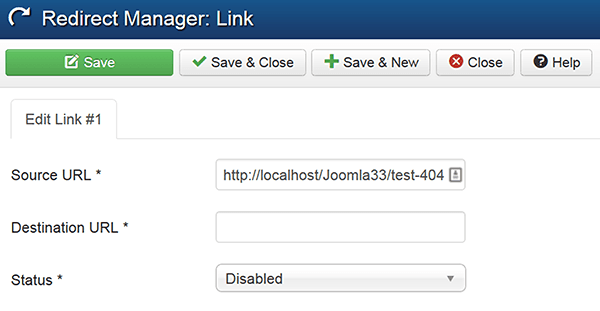 Joomla ships with a mechanism to monitor 404-errors that also allows you to set a redirection target. Go to Components -> Redirect and you will see them in the Redirect Manager: The first time you use it you will be notified that you first have to enable the Redirect plugin from the Plugin Manager. Of course first of all it should be enabled, but you also have the option to switch on the Collect URL's option. 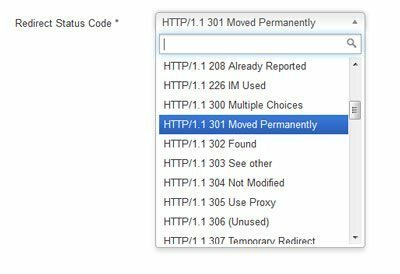 The reason it is switched off by default is that the database could be flooded with redirect URL's if you don't monitor them. Every site has them, also correctly set-up sites. This is mostly because of bots and hackers crawling your site for exploits. That is why I advise you to either monitor regularly (on a monthly basis) or to only monitor URLs at times when you know you can expect 404-issues (say, after a site redesign). I usually choose the latter option. Opening any specific item will allow you to enter the new URL (either relative or absolute) and enable the record. This can save you a lot of time. Note that the records are enabled immediately, no need to set this separately. As long it is on, it keeps collecting URL's, but if it is switched off, it will stop doing so, but the earlier configured redirects remain active. This is really the one feature that the component was lacking, and now it is an extremely useful component that I will actually use! The good thing is that this is a very exact way of dealing with your redirects. No extension needed, as long as you know what you are doing. Also, performance is least affected, as these redirects are executed by the Apache server software before Joomla is even activated. (Note that the first line is usually there by default, so place the other 3 lines after this one). Finally: don't forget your images! They need redirecting just as "normal" pages. See this blogpost here: www.gsqi.com/marketing-blog/how-to-redirect-images-during-website-redesign-or-migration. Note that when you redirect a URL, the "value" of the old URL is mostly transferred to the new one, but not 100%. In this study by Moz, it was found that 10-15% of the average rankings were lost when URL's were redirected. Especially when redirecting is not a must, say when you just want a slightly cleaner URL than the existing one, (maybe /swimming-pool versus /swimmingpool-constructor), this might be a consideration. Of course, there are nice extensions for this purpose as well. A nice one is Yireo's Dynamic 404, which is capable of 301-redirecting not-found pages to the most corresponding existing one. By the way, since version 4.5, also SH404SEF has the option to automatically forward 404-errors to the most corresponding correct page.